This Karwa Chauth, decorate your hands and feet with intricate, unique and modern mehendi designs! Make this Karwa Chauth a special one. Get into the groove with the right makeup trends, chic couture and of course, one of the 30 stylish mehendi designs, we bring forth to you. 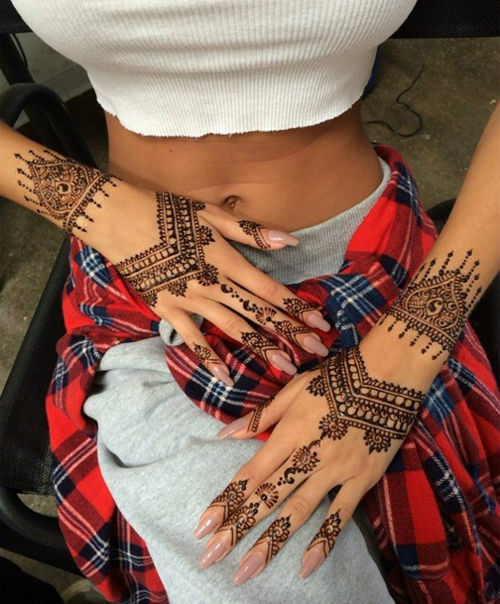 Since henna has always been part and parcel of the Indian lass’s shringar, leaving out the hands and the feet, or keeping them bare would be a crime. Honoring our traditional values and cultural connotations shouldn’t be a chore, not when we are here to help you find the choicest of mehendi styles and designs to flaunt. 1. 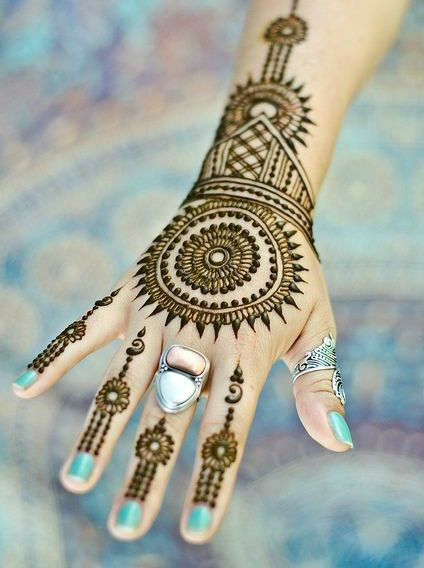 For the palms, you could think of mehendi designs in the form of the mandala, pretty flowers or the sun God! 2. For the back of the palms, you can get protection symbols drawn. After all, Karwa Chauth is a pledge from the wife to the husband for his long life. Symbols such as clenching shields or defending shields could be drawn. 3. Mehendi designs for the feet have many meanings in our Indian culture. Some say the feet are a point of contact with the ethereal worlds; crossroads where the divine meets the earthly soul. 4. Do you like peacocks? Utmost beauty and grace, symbols of mehendi designs flaunting peacocks are an all time favorite, and the motifs epitomize beauty and grandeur. 5. Success for your hubby: As a wife, your hubby is your soulmate and it is in his success where your happiness would be. 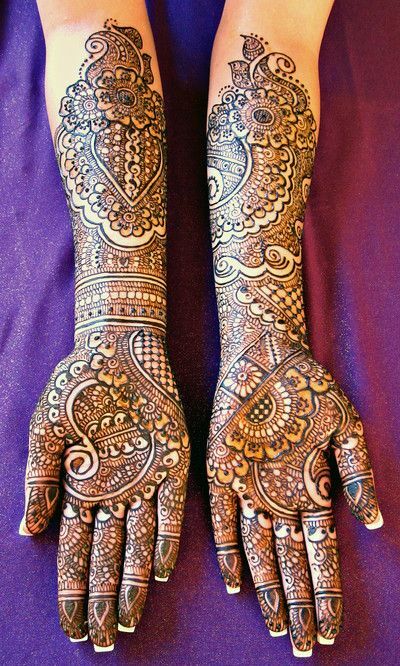 Drawing swan motifs in mehendi designs on your hands would resonate and flaunt the same. 6. Messengers of the divine: It is said that the feminine soul is a connection between the heavens and the earthly plane. With that being kept in mind, you could manifest the same with birds as mehendi designs. 7. Transformation galore: From the days of struggle to happiness expected ahead, as his wife you would be showing him a better future with butterflies decorated on your hands and palms. 8. Love is in the air: What better way to perk up the romance this Karwa Chauth, than to have a pair of parrots or peacock symbols drawn on your palms and hands. 9. For ever and ever: Pledging togetherness for this lifetime and beyond, allow the motifs and drawings of mehendi designs with dragonflies to epitomize the same. 10. Keeping a watch on his well-being: As his wife, you not only run his home but would have your eyes on every aspect of his well-being too. Show him the same with a pair of fishes drawn on your hands. 11. Happiness and joy: Bring in more happiness and joy with plenty of flowers drawn on your hand, your wrist and your feet. Spread the fragrance of love this Karwa Chauth and make him happy too. 12. Leaves and vines: More often than not, most of us would wear vines and leaves on our hands and feet as mehendi designs. The symbolism here represents the entwining of two souls into one, where devotion and vitality, longevity too is spoken off! 13. Lotus: For grace, purity, creativity, charm and feminine powers galore; mehendi designs showcasing the lotus flower is the best to flaunt around this Karwa Chauth. 14. The moon and celestial objects in the night sky: Romance and love, long lasting togetherness and more; aptly represented by the celestial objects of the dark night sky. 15. The evil eye: Ward off the unseen dark forces and the evil eye with mehendi designs of the big eye drawn on your palms. 16. Squares: The use of squares in mehendi motifs or designs talks about protecting the sick and healing powers of the feminine hands for the ill. Here were some of the symbols and its meanings with 30 mehendi designs. So stylish and chic, your hubby would be impressed with the care and love you have put in for him. Have a blessed Karwa Chauth!